We may have already had the first snow of the season, but the city of Philadelphia has plenty of holiday happenings to warm even the chilliest days. Bundle up and use this guide to all that is jolly to plan a holiday season that will dazzle and delight. Whether you favor the history that the city is renowned for, or you want to start a brand-new tradition, there’s something that will make the season merry for everyone. We know it’s not even Thanksgiving yet, but we can’t help our excitement. Make the Museum a part of your holiday tradition and join us as we usher in this cheerful season with a Tree-Lighting Celebration on Wednesday, Nov 21. Check out our Facebook event for more information. When: Wednesday, November 21 from 5 p.m. to 8:45 p.m.
Holiday traditions abound at the Philadelphia Museum of Art, kicking off with the FREE ceremony celebrating the lighting of the 55-foot-tall white fir tree on November 21. Admission to the museum is “pay what you wish” after 5 p.m. When: Tuesday, November 27 at 5 p.m. This Philadelphia custom is sponsored by the Friends of Rittenhouse. Bring a new, unwrapped toy to donate to deserving children in our region and watch the 30-foot tree and globe park lights shine for the kick-off of the holiday season in Rittenhouse Square. This event features family-friendly activities and music, and the tree will continue to be lit nightly for the month of December. When: Wednesday, November 28 at 5:30 p.m. This 65-foot-tall Philly-themed Christmas tree is topped with a Liberty Bell and features an artisanal steel base that weighs 30,000 pounds and represents 22 of Philadelphia’s neighborhoods. The tree is powered by NRG, and is the premier tree lighting in the city. When: Thursday, November 29 from 5 p.m. to 8 p.m. Kick off the holiday festivities in Old City by attending this tree lighting celebration featuring Betsy Ross, musical performances, and seasonal treats. This year’s stunning holiday tree was designed by Old City’s Parisian influenced florists: Petit Jardin en Ville. When: Friday, November 30 from 6 p.m. to 9 p.m.
Ring in the season with a full evening of musical performances, dancers, and ice skaters, culminating in a grand tree lighting and landslide fireworks. The two-hour performance includes West Chester’s own country artist and finalist on Season 14 of The Voice, Jackie Verna; and Philadelphia-based singer-songwriter Bianca Ryan, the first winner of NBC’s America’s Got Talent as well; as fourteen other local favorites. Philly’s one-stop shop for tree rental, delivery, and set up. Visit the website to schedule a delivery or visit one of the four pop-up shops in Philadelphia. You can bring your tree home with you or arrange delivery. Center City, 1501 John F. Kennedy Blvd; Cherry Street Pier, 121 N. Christopher Columbus Blvd; Fishtown, 1340 Frankford Ave; Spring Garden Street, 611 Spring Garden Street. RiverRink is celebrating 25 years of being a Philadelphia winter tradition with FREE ice skating on opening day, November 23. No better way to ring in the winter than with a visit to this wonderland, featuring a world class ice skating rink, and rustically beautiful décor. Sit under the glimmering lights while drinking a hot chocolate or rent a cozy cabin for a party with friends and family. A Philadelphia tradition since 1956, the Christmas Light Show at Macy’s in Center City illuminates the Grand Court inside the historic Wanamaker building, delighting people of all ages with 100,000 LED lights and holiday music from the Wanamaker Organ. Don’t miss Dickens Village on the 3rd floor, an animatronic holiday tradition that brings Charles Dickens’ A Christmas Carol to life! In the most historic square mile in all of the U.S., behold the sights and sounds of the season from Thanksgiving to Christmas. Peruse the holiday window contest, visit the community menorah at the Betsy Ross House, shop the Old City Market, or plan to attend one of the many other scheduled activities, including concerts, historical chocolate demonstrations, and more. What a perfect opportunity to learn about traditions of old, and maybe start a new one in your family. When: Daily, November 15 – December 31 (Closed Thanksgiving and Christmas Day)*, 4 p.m. to 8 p.m., open until 9 p.m. on Fridays & Saturdays *Please note there is no 6 p.m. show on December 31. Dazzle in the lights of the Electrical Spectacle Holiday Light Show presented by PECO. Named one of the Top 10 Holiday Festivals in the nation by Fox News, Franklin Square is a must-see holiday sight. Enjoy the nightly illuminations, as more than 75,000 lights dazzle in the square, set to a soundtrack of holiday classics. The Philly Pops perform every 30 minutes beginning at 4:30 p.m. daily. Additional festivities include mini golf, Santa Saturdays, Seasonal Sounds on Sundays, and a train ride around the square on the Lightning Bolt Express. Children can deliver notes to Santa’s mailbox any day of the week. In addition to loads of sparkle and magic for children, adults can warm up with a winter beer garden and firepits. Don’t forget to stop by Ben’s Sweets & Treats to create and taste a variety of treats such as s’mores and gourmet hot chocolate stations inside the heated tent with views of the Square. “Christmas in Fairmount Park” celebrates its 47th year of delighting visitors with this year’s very special theme, “A Very Philly Christmas.” This Philadelphia holiday tradition features five of the park’s treasured historic houses – Cedar Grove, Laurel Hill Mansion, Lemon Hill Mansion, Historic Strawberry Mansion, and Woodford – decked out in the season’s finest. In the spirit of this year’s theme, the historic houses will host four special events showcasing what makes Philadelphia a very special place: music, food, neighbors, and families. If you would prefer to drop by on your own time, drop-in tickets can be purchased for $8 per person, per house, or you can buy a $25 “December Drop-in Pass” which will gain you entrance to all 5 houses for the month of December. When: Preview Weekend November 17 and November 18, then officially open November 22 to December 24, Sunday – Thursday: 11 a.m. to 7 p.m., Friday – Saturday: 11 a.m. to 8 p.m., Thanksgiving Day: 9 a.m. to 5 p.m., Christmas Eve: 11 a.m. to 5 p.m.
Find the perfect gift for the ones you LOVE in the newly renovated Love Park. Christmas Village returns, for this very special Philadelphia tradition. Visitors can experience the magic of an authentic German Christmas market as they shop 80+ vendors selling authentic European food, ornaments, and crafts. The market kicks off with a ceremony on November 25, featuring a special visit from the Nuremberg Christkind, the German equivalent of Santa Claus—and like Santa, she won’t be coming empty handed. New to the market this year is expanded seating and an outdoor beer garden. Plan to attend during the HoHo Happy Hour, where food and drinks are discounted every Wednesday from 4 p.m. to 6 p.m.
Sunday – Thursday: 11 a.m. to 7 p.m.
Friday – Saturday: 11 a.m. to 8 p.m.
Thanksgiving Day: 9 a.m. to 5 p.m.
Black Friday: 9 a.m. to 8 p.m.
Christmas Eve: 11 a.m. to 5 p.m.
Now in its 4th season, the Made in Philadelphia Holiday Market transforms Dilworth Plaza into a shopping haven for locavores looking to purchase special gifts from regional vendors. This outdoor market was created to accompany and complement all the globally sourced options available at Christmas Village in Love Park with unique specialty items right from our area. There will be something for everyone on your shopping list, as well as live crafting demonstrations, warm drinks, sweets, and some Philly food favorites. When: December 8 from 1 p.m. to 6 p.m.
A one-of-a-kind holiday event featuring a parade of local working boats and leisure vessels on the Delaware River “decked” out for the holidays in magnificent lights. Visit Santa’s holiday workshop on the water before the parade to make a special craft. The parade starts at 5:30, and the best place to watch is from the museum’s second story terrace. 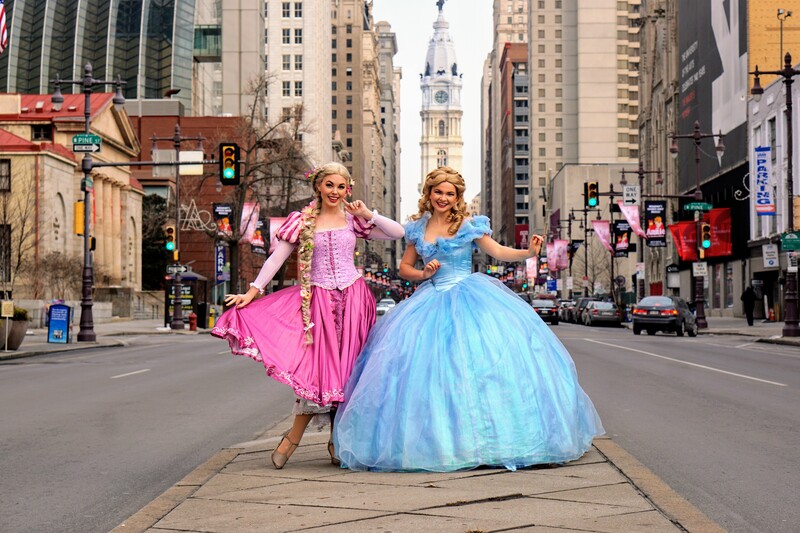 When: December 16 at 3 p.m. and 6 p.m.
Philadelphia Theatre Company welcomes back everyone’s favorite princesses for a heart-warming afternoon and evening concert for the entire family. During A Dream Is A Wish: Holiday Princess Concert audiences will sing-along with a gathering of princes and princesses from popular movie musicals and television shows in a one-day-only event. Children are encouraged to come dressed as their favorite prince or princess. After the show, the cast will host a meet-and-greet reception with holiday cookies, apple cider and photo opportunities. Tickets are on sale for $35 at philatheatreco.org, at the box-office, or by calling 215-985-0420. It’s one of the most celebrated holiday pastimes of all! The Pennsylvania Ballet puts on a spectacular performance of The Nutcracker every year at the Academy of Music. Bring family members and friends of all ages for an evening of magic at the ballet. This year the Academy is hosting two very special teas with the Sugarplum Fairy. Make sure to reserve your tickets in advance.